The newly open Mercure Bandung City Centre is the ideal place for business & leisure travelers who want to stay in the heart of Bandung. The team and I look forward to welcoming you! Mercure Bandung City Centre features 163 spacious and modern rooms, ballroom, meeting facilities, rooftop swimming pool, bar with stunning views of Bandung, trendy restaurant and basement car park. It is only 25 minutes from Bandung International Airport, 14 minutes from Bandung railway station and walking distance to Gedung Merdeka at Asia Afrika street, one of the heritage areas in Bandung, which is also a culinary destination. Experience Bandung with the story from many historical places around, such as the famous Asia Afrika Museum and Grand Mosque of Bandung at Braga District Area. A simple yet elegant room equipped with LED TV, modern designed furnitures and bathroom. With choices of single or twin bed type, the city or mountain view from this room will pamper your sight and senses. Enjoy a great culinary experience with international favorites, live cooking stations and wide selection of a la carte menu available at this inspired All-Day Dining venue with indoor and outdoor seating. New concept of chill out place where you can relax and have fun. 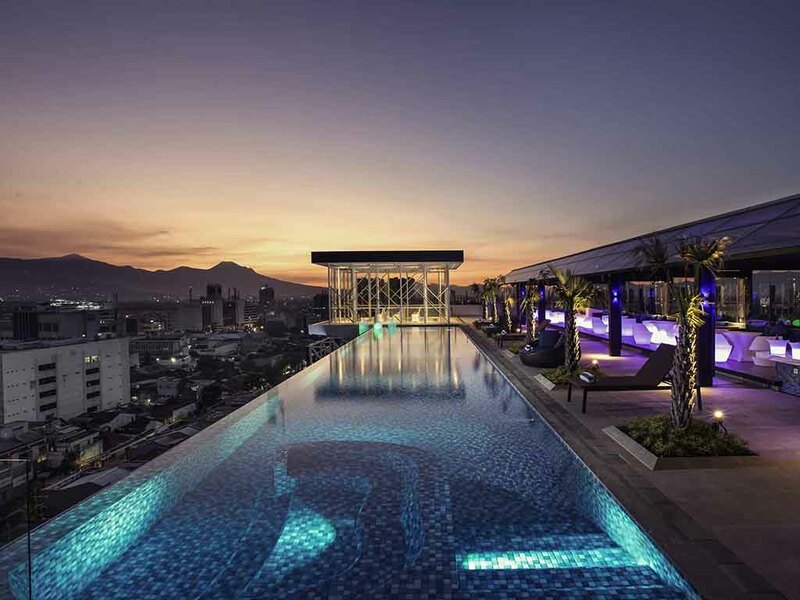 The combination of infinity pool, rooftop bar with spectacular view in the heart of Bandung City.